This 8 days Dhampus Sarangkot trek itinerary is a whole Nepal visit itinerary so only the trekking is 3 days trek. Dhampus Sarangkot trekking itinerary is one of the very easy and short treks to see the Annapurna, Dhaulagiri, Manaslu, and Ganesh Himal massif. A beautiful unblock sunrise can be seen from Sarangkot and Dhampus in this trek. Upon our arrival in Kathmandu, a representative will pick us up from the Tribhuvan international airport Kathmandu by private transport and transfer to the hotel. we have a trip meeting at our hotel with the company manager. Overnight at the hotel. 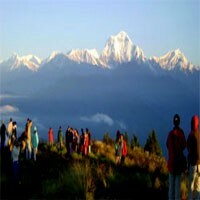 Today we have the Kathmandu full day city tour with an experienced tour guide and private transport. The guide takes us to 4 world heritage sites of the UNESCO and briefs us about the sites, culture, religion, and history. We visit Kathmandu Durbar Square, Swyambhunath, Pashupatinath, and Bouddhanath today then drive back to the hotel. Overnight at the hotel. Day 03 : Drive/fly to Pokhara.(820m.) 6-7 hrs. We drive or fly to Pokhara from Kathmandu today. Pokhara is the beautiful lake city where we can enjoy near the lakeside after our check in to the hotel. Overnight at the hotel. Day 04 : Drive to Phedi, trek to Dhampus.(1650m. )3 hrs. After our breakfast and view of the scenic mountains from our hotel than we drive by private transport, about half an hour to Phedi from where our trek starts. We ascend about 3 hours to Dhampus from where we see a beautiful sunrise and the stunning Annapurna and Manaslu mountain range including the most attractive mountain Fishtail (Machhapuchchhre). Overnight at the guesthouse. Day 05 : Trek from Dhampus to Sarangkot.(1592m. )6 hrs. 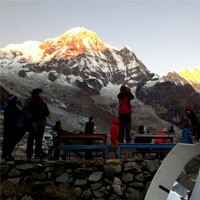 After viewing the sunrise, and the scenic mountain range, we have our breakfast then start our trek to Sarangkot. The trek won't be that difficult today but is a long day walk on the flat trail. The journey to Sarangkot from Dhampus takes about 6 hours. We may see the Sunset with Dhaulagiri, Annapurna, Manaslu, and Ganesh Himal massif this evening from Satangkot. Overnight at the guesthouse. 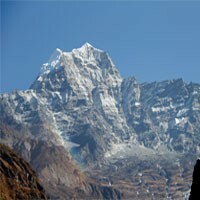 Day 06 : Trek from Sarangkot to Pokhara and city tour. We walk about 15 minutes from our hotel to the tower early morning for the beautiful sunrise with a stunning mountain view and come back to the guesthouse for our breakfast. We enjoy our breakfast with the view of the Pokhara city and the Fewa lake. Sarangkot is the place to fly down to Pokhara with paragliding so if we would like to fly, we may or trek down. The trek is about 3 hours to the lakeside. After dropping our bags in the hotel, we head on for the Pokhara city tour and drive back to the hotel. Overnight at the hotel. Day 07 : Drive back to Kathmandu. We drive this morning by the tourist bus to Kathmandu with the view of mountains, valleys, terraces, rivers, and much more. It takes us about 6-7 hours driving from Pokhara to Kathmandu. We have a farewell dinner with the company this evening. Overnight at the hotel. Day 08 : Departure to the international airport for your final flight. The company provides private transportation to drop off us to Kathmandu international airport for our final departure to back home.